We have improved our products! 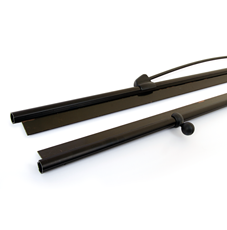 We are pleased to inform you of two new improvements to the Twist range that will take effect from the 25th March 2013. To improve both the appearance and strength of the magnetic linking at the top and bottom of Twist banners, we now supply notched finishing strips for Twist and Flexi-link graphic panels. Magnetic tape can now be applied accurately from the top to the bottom of all graphic panels creating a much-improved seamless join. To complement this latest innovation our new Easi-link is slightly longer and is now white to help differentiate from existing black magnetic bars. Anyone that wishes to use their older Easi-link kits with the new finishing strips will have no issues concerning compatibility. We now offer LED lighting with all Twist banners as standard. The new lights have improved benefits which include; longer life, more robust build quality, lower power consumption, less heat discharge, can be used in North America and produce improved graphic colour interpretation. Although there is a small price increase please note, that we still have stock of the original halogen lights if required. All of the above are now standard stock items, however if you would like to purchase any old style lights or finishing strips we have approximately six months worth of stock so please make it known to us when ordering. A NEW lightweight flexible alternative has arrived! Sold only as a 3 panel kit complete with hardware, packaging and graphics tube, it has been designed to fill the gap between the numerous budget exhibition stands and the pop up modular display market. Curve costs less than a pop up display stand or three medium priced roller banners. Weighing only 15kg and with the ability to create your own stand configurations, the Curve display stand has been designed and manufactured in the UK to offer a legitimate alternative to pop up and roller banners. 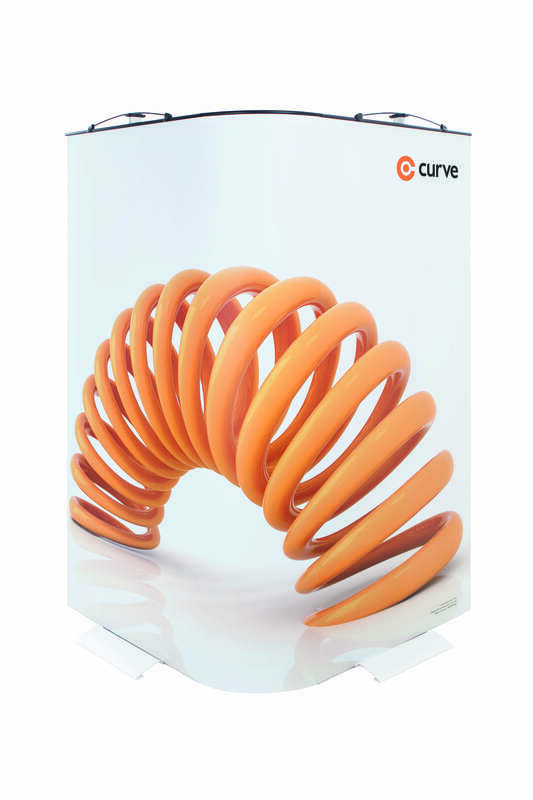 The Curve allows you to create and recreate virtually any shape you require without having to change hardware or graphics. Using the same patented tensioning system as the Twist, graphics can be easily aligned allowing multiple kits to be seamlessly joined together even ondifficult floors. The complete Curve including graphics weighs only 15kg, making the Curve one of the lightest 3-panel exhibition kits available.